This Democracy Now! 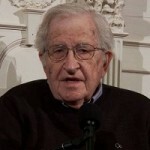 special features the world-renowned linguist and political dissident Noam Chomsky. In a public conversation with Amy Goodman in April, he talked about climate change, nuclear weapons, North Korea, Iran, the war in Syria and the Trump administration’s threat to prosecute WikiLeaks founder Julian Assange.